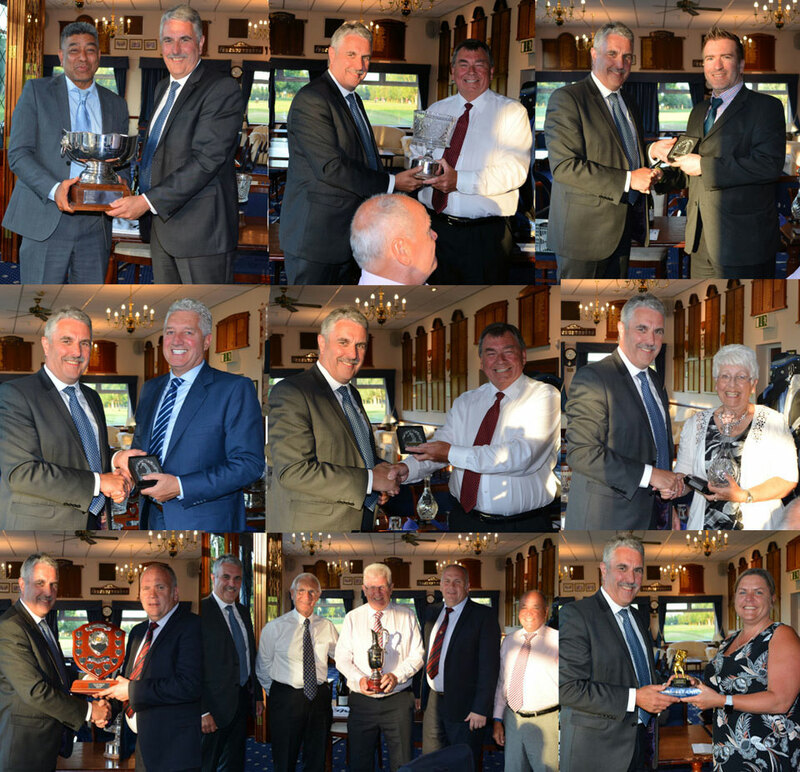 The annual event of the Warrington Group Masonic Golf Society was again held at Haydock Park Golf Club. The course is an attractive well-established parkland course of 18 holes, 6058 yards, designed by James Braid. Gents teams before teeing off. Most fairways being lined by well-established mature trees. Greenside sand traps and fairway undulations present difficulties to both high and low handicappers alike. Haydock Park is an ideal venue and has hosted the group’s golf day several times in the past. The course was in fabulous condition; both fairways and greens were immaculate. The weather forecast indicated wall-to-wall sunshine! Some of the players said it was more like playing in the Mediterranean and shower proof clothing was quickly packed away and suntan lotion and sun glasses were in abundance. Following a light lunch of soup and sandwiches, the first group consisting of Ian White, Wayne Robinson, Dave Goddard (event organiser) and Sabar Hussein teed off at 1:10pm. A very welcome slight breeze was occasionally felt between the trees. A subsequent gents three ball and a four ball (with Chris Eyres acting as ball locator and flag minder) teed off. The ladies, now an integral part of the event were led out by Tricia Whitlam, Sarah Wilks and Jean Starkey. They were followed out by two more teams of three ladies and the final four ball gents team. Ladies teams before teeing off. Many players commented that the course was a pleasure to play; it was in wonderful condition and a fabulous day. An excellent three course meal followed which was served in the pleasant surroundings of the club house restaurant and enjoyed by all. Many complementary remarks were made with respect to the whole day, the weather was fantastic, the course was in exceptional condition, the food was first class and the company excellent – a truly fabulous day. Dave Goddard introduced Andy Barton, Warrington Group Chairman, who presented the winners with their prizes, which were: Sabar Hussein for the R W Collins Trophy, Dave Goddard for the Ron Hankin Trophy, Ian White for being nearest the pin on the fourth hole, Michael James for the longest drive on the 10th hole, Dave Goddard for being nearest the pin in two on the seventh hole, Jean Starkey for the ladies Phil Gartside Memorial Trophy, Tony Black for the Visitors Shield, Alex Roberts, Paul Dolman, Tony Black and Dave Green for the Rainbow Trophy and Sarah Wilks for the Perseverance Prize. Andy thanked Dave Goddard for organising the event, the course staff for their help in providing the event with great facilities and a beautiful course, the catering staff for the excellent food, the event sponsors particularly Barry Jameson and Dave Goddard for their generous and kind support of the event, the members and everyone for supporting the day. He concluded by giving special thanks to the ladies for their continued support. Dave announced that the day had raised £171 for charity and said he had booked the event for the 6 June 2019. Once again, he thanked all for their kind support and was looking forward to welcoming everyone next year. Winners appearing in order as the list above from top left to bottom right.